A cold and blustery winter in the early 1900’s set the tone for a two-month-long fishing outing in the North Atlantic seas. The deckhands and captain were sailing northward while trying to endure the wicked ocean weather being sure to fill their fish quota. The shipmates were having sour luck with catching the sea critters, which they would eventually cash in at the dock for money to support their families, or support their bad habits. Frustrated and annoyed, the mates left a large net lay in the dark ocean while they departed into the cabin for a healthy game of poker and some drinks. Laughter and the sound of festivities pored out of the small cabin door while the net lay still on the floor of the ocean. After a few hours of jokes and drunken gambling, the group of mates rushed to the deck to pull the net in hopes to find some heavy tuna. They grumbled and groaned as they pulled the large ropes to hoist the net up from the dark bottomless depths of the north Atlantic. It would seem like forever, but the beginning of the net finally reaches the surface. The net gets heavier as the weightlessness of the ocean vanishes. A few members of the crew look down the ship’s side to see if their luck had changed. In total shock, one of the mates yelled “Monster! Giant down-below!” In panic, the mates continued pull up the beast trapped in the net in hopes to find something they can cash in on. When the creature was finally aboard, it broke free from the net and viciously attacked the crew one by one. Some members jumped overboard to escape the beast, and other barricaded them selves into the cabin. What was this grotesque creature? The shipmates call it “The Crab”. Tracy had an extraordinary imagination when he thought up this stunt. Even though the end result is painfully obvious and totally predictable, it is still a great work of art. This display, which came from the defunct Ghost Ship from Ocean Playland Amusement Park, is very detailed in terms of setting. The walls represent the inside of a ship’s cabin and gives a very nautical feel to this spooky stunt. 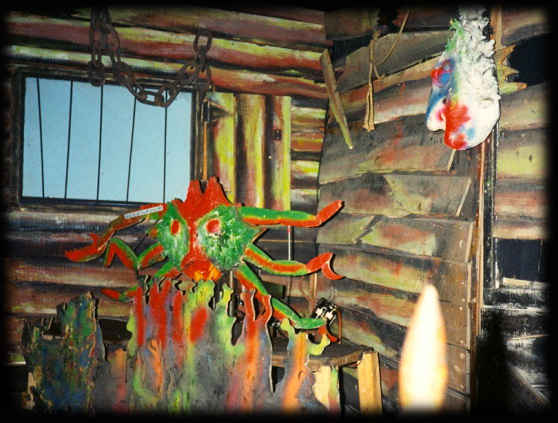 The Crab itself was removed from the Haunted House right before the 2006 season and was replaced with a Mummy prop. However, it amused riders for 18 years prior as it sat in this seaside corner in on the second floor of the Haunted House. The Crab was made of wood and plaster. The Crab originally had wooden “legs” (three on each side) which were attached to the main body and partially supported by springs which would make the legs move upward and downward. The crab had small craft-like leafs glued to the front to give a scaly texture, as did the coinciding fish hanging on the wall. As the car passed by, the Crab would rise up on a air-powered pneumatic cylinder. As soon as the car passed, the Crab would return to its home-position. Sea grass, which was cut out of wood, covered the front of the platform for this stunt in order to hit the pneumatics and relay. The shape and makeup of this stunt reminds me of the Ghost Ship façade, which was a skull with crab legs protruding on the sides. The biggest problem the management faced was vandalism of the crab legs. Vandals would always rip off a leg, and the carpenter would have to cut out a new leg using a pre-existing template. The origin of the chain hanging on the wall is unknown. However, another piece of this chain was included in the Bar Tender stunt which was also removed in 2006. Purhaps this chain was part of the anchor that was used to pull up this sea beast. 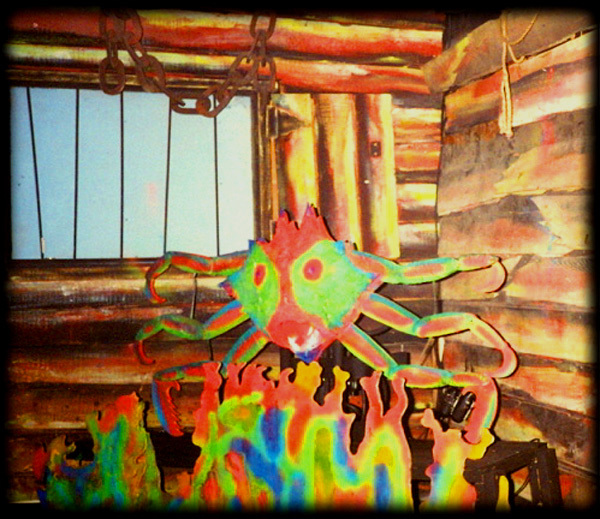 The ship deck scenery, although included in the Crab stunt, can actually be found throughout the second floor. It was used to cover a lot of dead areas and added nautical-themed décor to the bare walls. Further into the ride, large backdrop scenery panels from the Ghost Ship can be seen near the Electric chair. Wall décor can also be found near the coffins, the Bar Tender and where the Mermaid used to be right before the ride’s balcony exit. I have always wondered why Granville decided to put this stunt as the greeter when reentering the ride from the balcony. My conclusion is based on logic; the Crab was simple and did not take up a lot of square footage in comparison with the rest of the Ghost Ship stunts. Because the corner was small, the Crab seemed to be the perfect fit and utilized the space effectively. Furthermore, it set the stage for what was coming around the next bend. 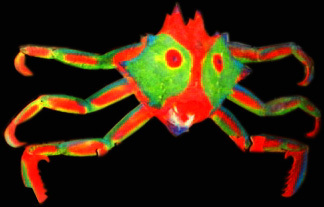 Around the mid to late 90s, Clifford refurbished the Crab; it was repainted and all legs were cut from fresh wood. The newly restored Crab did not last though. As you can see in the picture to the right, the crab's wellbeing was always in jeopardy due to rude riders, and was pulled apart in no time. The Crab was thrown into a dumpster that winter, never to be seen again. Although I wish it was restored and perhaps moved to an alternate location, I understand the Trimper's need to keep the audience interested by adding newer and more modernized stunts.